Local favorites for those ice cream cravings, as told by a tried-and-true Clevelander. Cleveland, Ohio is known for its sports teams (both good and bad), its Midwest charm, and its food scene, which is quickly becoming one of the best in the country. The homegrown, local vibe of the Cleveland food scene can be easily found in its many local ice cream shops, serving up everything from ice cream, to fro-yo, to frozen custard. No matter the season, nothing beats a cold scoop of your favorite flavor. These venues are some of my favorite places to go to get a sweet fix of ice cream in the Greater Cleveland area. This local favorite, started by two brothers in 1999, continues to serve the city and suburbs with high-quality ice cream, using fresh ingredients grown around the area. There's 8 shops located around Cleveland, so no matter where you're visiting, you're sure to find a store. Must-try: A scoop of Blue Cosmo, an original flavor combining cotton candy ice cream and a marshmallow ribbon into one tongue-staining blue treat. Make sure to ask about adding dinosaur sprinkles to the top for the perfect Insta-worthy finish. A soda fountain/confectionery hybrid named after the founder of the city, this place isn't messing around. It uses high-quality ingredients to make its own ice cream, sodas, phosphates, milkshakes, and malts. They also offer enough homemade candies and baked goods to make your head spin. Must try: Their list of mountain-size sundaes, like the ten-scoop Terminal Tower, offer quite a challenge for any ice cream lover, but their tamer sundaes are the perfect size to share. This classic custard shop (frozen custard is not the same as ice cream) has been serving old-fashioned custard to hungry customers around Cleveland since 1985, and with a rotating list of flavors on offer, there's always something new to try. Their cakes, cookies, and milkshakes all use their signature custard to make a variety of cool, sweet treats. Must try: Their concretes, which are large cups filled with custard and toppings, are the perfect solution for a hot, sticky summer day. Try the Buckeye concrete to honor the Buckeye state of Ohio, or sample any of the 13 options on their menu. Located in the picturesque suburb of Chagrin Falls, The Popcorn Shop opened in 1949 and has been a signature stop for visitors and tourists alike ever since, with lines stretching out of the tiny riverside shop no matter the season. 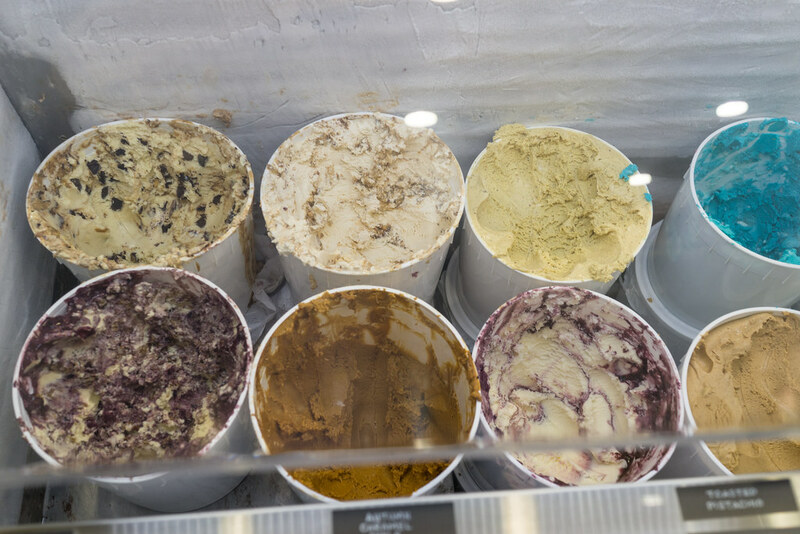 Besides making and selling a variety of small-batch popcorn, this shop also sells locally made ice cream in a ton of classic flavors. The nostalgia and small-town charm of the store and street surrounding it is the perfect place to treat yourself. Must try: The primary-colored "Superman" flavor is a childhood personal favorite (here's how to make your own), but newcomer "Chocolate Blackout" is decadently rich and packed with chocolatey goodness. This family-run store dishes out tons of house-made flavors, and they all use Amish-made Ohio honey as a sweetener. Their scoops are unbelievably creamy, and come in all shapes and sizes from a classic kiddie cone to a giant "Destroyer" sundae. However, their stores are only open during the summer and early fall, so act fast if you want a taste of their sweet stuff. Must try: Their signature flavor, "Honey Pecan," takes all the best things about Butter Pecan and adds honey to the mix to make it even sweeter. The next time you're in Cleveland, make sure to check out one of these spots. Whether you're a Cavs fan or a Warriors fan, we can all agree that ice cream is the best meal of the day.